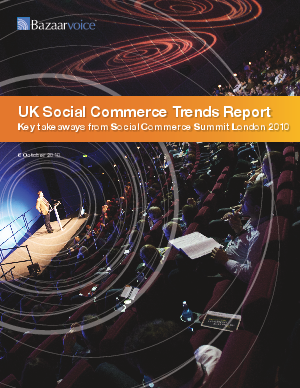 Each year, the Social Commerce SummitLondon brings together innovative brands and thought leaders to share best practices and trends in social media. At the 2010 event, national treasure StephenFry and JibJab CEO Gregg Spiridellis shared their views on the evolution of the internet and social media. The bottom line? Peopleare people — deal with them as people, notas “business decision-makers.” Stephen Fry especially encourages companies to simply “be human” as they deal in social media.Several UK brands, including Argos, Debenhams,and The Body Shop UK, shared specific strategies they found successful. And Forrester’s Patti Freeman Evans spoke on the future trends that continue to shape social media — and the way we interact beyond the web. This paper encapsulates the highlights andkey learnings from this event.